Hmmm, what do make with this homemade cream of coconut? Pina Coladas come to mind! By making your own tropical coconut milk your able control the sweetness by adding how much simple syrup to the mixture. Place into a saucepan and bring to a boil. Cover and allow to cool completely. Place into a food processor or blender and blend, scraping down the sides periodically. Place cheesecloth over a bowl and pour the coconut mixture in. Continue to press coconut until no more liquid is released through the cheesecloth. 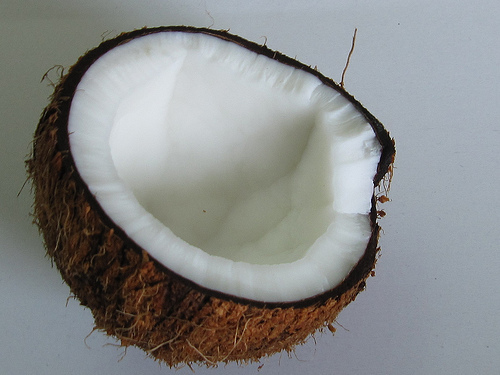 Remove coconut from cheesecloth and reserve. Place strained liquid into a sealed container and store in the refrigerator. The next day you will find that the milk has separated. The cream will settle to the top and can be scooped out and used as desired or you can blend the milk with the cream to produce full cream coconut milk. If desired, sweeten to taste with simple syrup. Mix 1 part sugar to 1 part water and bring to a gentle boil. Add into your coconut milk to taste and use in your favorite recipes! Use within 1 week or freeze for later use.